Have you seen these awesome Christmas plant/flower botanical prints That Ballard Designs have for sale? They are adorable!!! Since they are so adorable, I wanted some for my wall. But at $150, that was not going to happen... So, I enlisted the help of my Photoshop savvy husband to make them for me. After Matt had designed and sized them to what I wanted them, we sent them off to Sam's Club to be developed. We spent about $12 on four 12"x16" prints. Not too shabby. 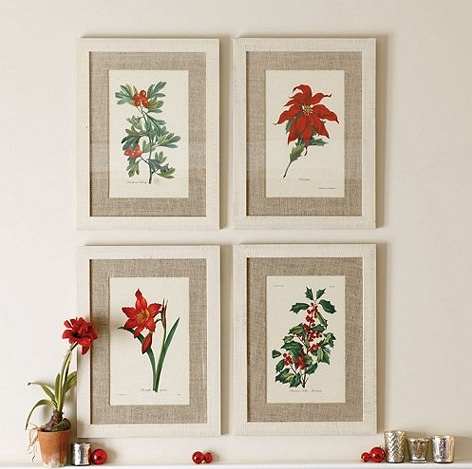 Once the prints were back, we put them in Ikea frames and hung them on the wall. These are so awesome I want some for my walls. Is there a way I could buy these digital prints from you!!! i's pay well!